I was just wondering when that big clackamas river clean up is this year, sometime in September? We definitely need drift boats to help carry trash! Last year we hauled out 3.08 tons of trash, from Barton Park to the mouth. It's grown even bigger, now we're an official non-profit with big plans for other rivers. I know it's traditionally been a lot of the paddling community behind it (kayakers, rafters) but it would be awesome to get more of the angling crowd involved (I've been involved with both, though more paddling the last few years). If anyone can help in any way, check out the website or let me know too. Last edited by Duz; 08-10-2009 at 11:17 AM. Sep 19th is international coastal cleanup day, and that includes inland rivers. I'll compromise, but I won't capitulate. Thanks and see ya'll there! The organizers say 375 people have volunteered. Last edited by Lamplighter; 09-11-2009 at 12:36 PM. It's gonna be a great day to play with trash! Weather is looking sweet, we have a big crew this year, a great bbq planned and a HUGE silent auction and raffle. Proceeds go toward future river cleanups, with some plans started for the Kalama, Molalla, and others hopefully in the next year. For those who didn't register beforehand, this year we're so full that we can't accommodate last minute volunteers. Keep an eye on the website though for more events! I was impressed yesterday by the crowd that turned out for the Clackamas River Cleanup. This was my first time and I enjoyed myself a lot. People were friendly, worked hard and had fun. Pods of rafts, kayaks, sport boats, dive teams, and "garbage scowls" picked up trash from their assigned 1-mile sections of the river between Barton and Clackamette parks. I hope the organizers report the total amount if stuff that no longer litters the Clackamas' water, islands, and river banks. I thought I heard something about adding a river (Washougal ?) to the clean-up next year. Please, each time you are on the river notice if it's cleaner and take out any trash you find. 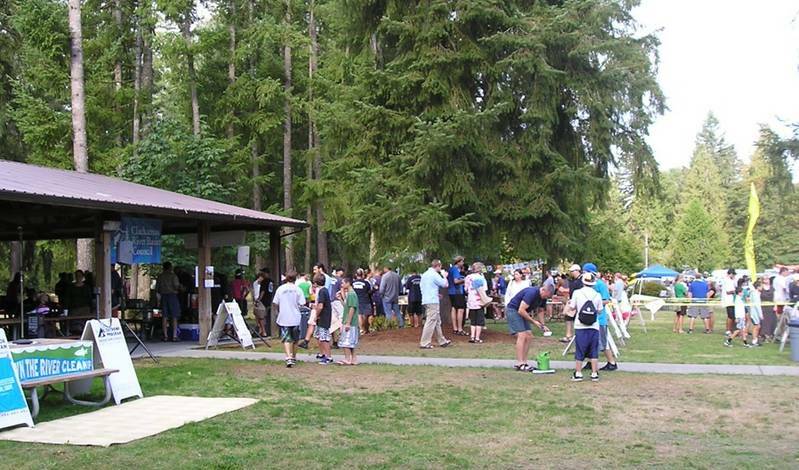 I was impressed by the crowd that turned out for the Clackamas River Cleanup. This was my first time and I enjoyed myself a lot. People were friendly, worked hard and had fun. 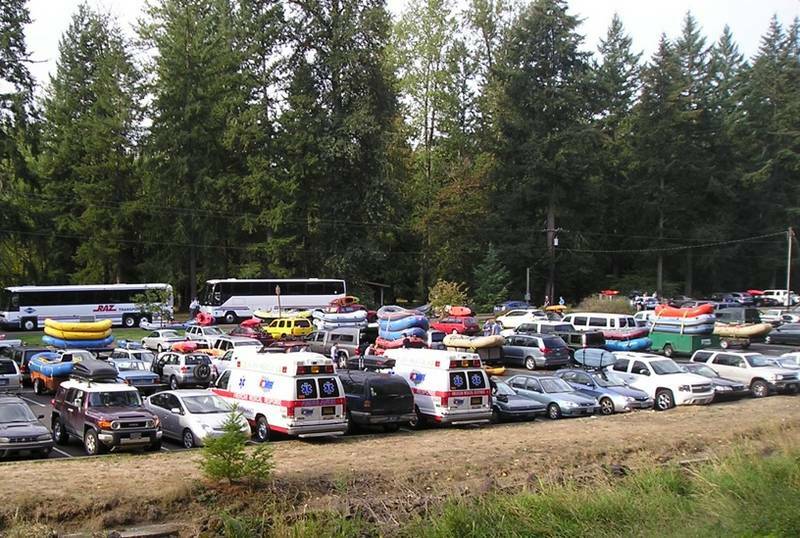 Pods of rafts, kayaks, sport boats, dive teams, and "garbage scowls" picked up trash from their assigned 1-mile sections of the river between Barton and Clackamette parks. I hope the organizers report the total amount if stuff that no longer litters the Clackamas' water, islands, and river banks.